Frustrated by the unending rivalry between his two sons for the succession of his party leadership the President of the DMK and Chairman of the Tamil Eelam Supporters Organization M.Karunanidhi has told on his 89th birthday that he would contest for the position if he was alive next year. Though he is ambitious to divide Sri Lanka on a short term basis the internal fight in his party would send all plans in disarray and fail to win support for a divided leadership from Sri Lankan Tamils, insiders of the party have complained. “I will contest (for the post) If I am alive after one year,” he told reporters in Chennai on Wednesday in what is seen as a message to his sons union Minister M K Alagiri and M K Stalin to put an end to rivalry that has sometimes turned violent on the succession issue. Initially reluctant to answer the query whether he would contest the organisational election, the 89-year old Karunanidhi said a year was still left for it but spoke about him contesting again when prodded more by the reporters, a report said. 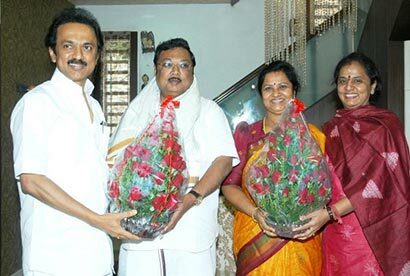 The DMK, smarting from its poor show in the April 2011 assembly elections, is dogged by intra-party clashes sometimes ending in deaths of faction supporters between the camps headed by Alagiri and Stalin.